Another one of those books about rules?Yes, except that this one may be the defining factor that will turn your dream into reality. Many have succeeded at being an entrepreneur, but many, many more have failed. Which side would you rather be on?Sure, entrepreneurship is often about breaking the rules. But there are also a number of them that you should follow if you want to survive long enough to … see what happens when you do.A business should be more than just a venture, it should be an adventure! The difference between a successful journey, rather than a wasted one, is knowing when to do what. That is what this book is about. Not science, but experience. 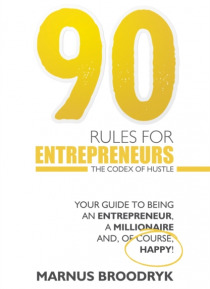 The rules of hustle.Based on Marnus Broodryk's business experiences, together with insights from friends and fellow entrepreneurs, 90 Rules for Entrepreneurs is your guide to avoiding the pitfalls, as well as seizing the opportunities, your handbook to being an entrepreneur, a millionaire and of course, happy.